I just figured something out after spending more time. I think there is a word wrapping bug. I have a line that includes a security code. The line is just long enough that it wraps to the line below. Secure notes are a great place to store these, but there are some issuI'm trying out 1Password. So far, a welcome breath of fresh air. RE: Dealing with extra long passwords? Please move this post to the relevant forum. Thanks! 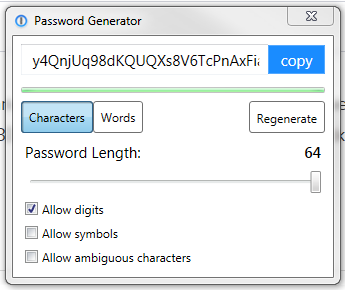 The Password Generator's word text doesn't auto word wrap. I agree but have to make it short to avoid word wrapping with this string. We can try "Masquer" and if it don't fit use "Cacher".